"Just Enough" or "The Tall Boy's Evil Twin" is located looker's left of The Tall Boy in the center of the frame. The hanging snowfield with a bit of sun on top and the big rocky exit in the shade. The winter of 2016/17 will be remembered as a long, snowy, and altogether great winter for all the skiers of Western North America. So, in light of some fat snowfall totals throughout the area, Patrick and I decided to tee off on some big ski-mountaineering lines that a lot of years wouldn't typically "go" as we like to say. Past missions had brought me in and out of the big terrain above Cascade Canyon on various routes, so I had a strong desire to revisit the area and "up the ante" on some larger lines that don't get skied a whole lot-if at all. One line in particular had caught my attention, a large hanging snowfield parallel to the more popular "Tall Boy Couloir" only this line had a large cliff-face halfway down the line which keeps most skiers away. In addition to some obvious route-finding while up on the mountain, the walk back to the trail head afterwards is no slouch either. Most skiing that takes place in and around Cascade Canyon typically occurs in the spring when the inner park road opens to bicycle and vehicle traffic after a lengthy snow clearing effort from the park service in March/April. Spring skiing is fun and all, but nothing compares to the feeling of skiing cold soft snow in big ski-mountaineering lines that generations past never really had the proper equipment to do so until the spring freeze-thaw cycles consolidated the snow-pack a bit. So there we were, pre-dawn start out of the trail head taking us up through the forest and into Glacier Gulch with breathtaking views of the Cathedral Group above us as the sun came over the Gros Ventre Range on the other side of the Jackson Valley. From a frozen Delta Lake, a long, steep, and altogether taxing ascent up to the saddle between Mt. Owen and Teewinot ensued. Skeats at this time were in a developing phase and proved extraordinarily useful on the steep skins-on climb to the saddle. Patrick, with his trademark no-nonsense straight up and down skin-tracks, provided some relief as we traded spots breaking trail through the varying snow conditions characteristic of blowing winds. The "mountaineering" in "ski-mountaineering" started to come into play as we put our skis on our packs and opted to climb through an ice-filled ascent route before topping out on the saddle where we would begin our descent. After transitioning to downhill mode, getting some mountain snacks in our bellies, and enjoying the view from the top, we decided to get moving as some big winds started making their presence known in the early afternoon hours. Our climbing efforts were rewarded as we put our "signatures" on the mountain; making big hero turns through the soft snow above the large cliff band high above Cascade Canyon. As we approached the cliffed-out zone from above we began scanning the area looking for anchor building options. We found a large boulder with a nice horn on it that was seemingly ideal for what we were trying to accomplish. With skis on my pack, I decided to lower myself down to peer over the edge to really size up how far down we needed to go. The night before had been spent viewing pictures from my personal vault, as well as, some time spent flying around on Google Earth studying what we may be getting ourselves into the next day. Now, on top of the large cliffed-out section, peering down below had me a bit nervous as I realized our rope wouldn't be long enough to make this rappel as we currently have our anchor station set up. Climbing back up to my anchor I revealed to Patrick the situation we currently found ourselves in. After a short discussion, we decided climbing back up and over the way we came would be an option if we couldn't figure out a better anchor station that would give us a bit more length on our rope over the cliff. Rappelling single-stranded and abandoning our rope on the route was a topic of discussion as we struggled to build an anchor on the ice-covered rock beneath our feet while constantly being reminded of the big terrain we were in with every strong gust of wind that hunkered us down as we began excavating around a boulder with our ice axes. After breaking through a considerable amount of ice, lacking ice screws for an anchor, I was able to rap a short length of accessory cord around a boulder to be used as a proper anchoring device. Shortly thereafter, I threw our rope over the edge of the cliff hoping it would touch the snow beneath the cliff allowing for a safe rappel. It was close, so I decided to go for it; rappelling the roughly 30+meters to the safety of snow below and literally rappelling off the end of the rope a meter or two before my feet actually touched the ground. On most other years without a fat snowpack, this mandatory rappel would go closer to 40 meters and wouldn't have been an option with the length of rope we were carrying. From the bottom, I was able to instruct Patrick on a slightly different rappel route of the large cliff band which we were not able to see from above looking down which provided a safer alternative to rappelling off the end of the rope while still suspended a short distance above the snow below. With both of us a bit shooken up, cold, and a bit unnerved from the stressful rappel we took a couple deep breaths before clicking into our skis to continue the remaining skis on descent into Cascade Canyon. We were rewarded for our efforts with more cold smoke turns before reaching the bottom and starting our long walk home over the frozen Jenny Lake. As we approached the truck at the trail head a couple hours later we were ready for some hot food, a beer, and some sleep after such a big day in the mountains. Going up there, scaring yourself a bit, feeling the pull to get back to the bottom safely, then successfully doing so brings a great feeling of accomplishment upon completion. Sometimes you ask yourself "what am I doing up here right now? I could be riding chair lifts at the resort, drinking beers at the bottom with my friends". 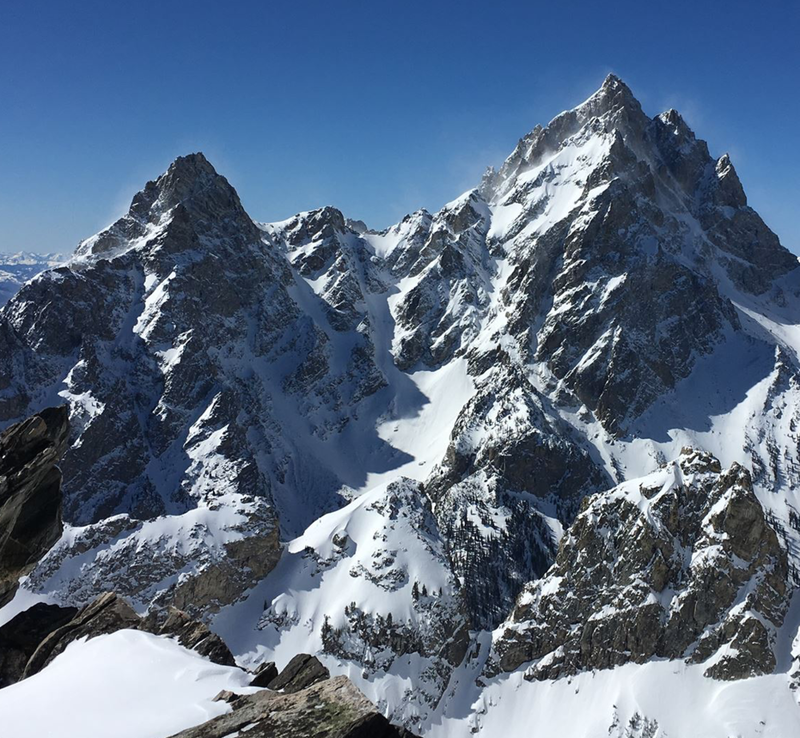 We all know that just wouldn't be as exciting as adventure skiing big ski-mountaineering lines in Grand Teton National Park. We decided this route needed a proper name, "Just Enough Couloir" seemed appropriate after having just enough rope to successfully complete the route. On of my skiing mentors (Patrick) and one of my old friends and partners (Giles) were living together this winter in the Tetons so I had been planning a trip back there for about 6 months. Every morning with breakfast I had been reading the avalanche report and just sitting on my thumbs waiting for the conditions to be right for the trip. Finally after a giant warm storm a week long break in the weather appeared. So I loaded my car and headed to the Tetons! On my way there were a few trials. Wet slides had closed every road into Jackson so I had to stay with my friend, Amy, in SLC. The next day I woke up early to get finish my drive, but I hit a deer on my way to Jackson so I had too get towed back to SLC and stay with my friend John. My car went to the body shop but I was able to catch a ride up to the Tetons the next day with a friend of a friend who is now just a friend and who I ended up skiing all week with, Kordell. Finally in the Tetons, the weather was indeed good and the wind was indeed still. Patrick had made us dinner which was ready upon arrival. We knew it was going to get warm that week and soft snow up high would quickly turn into breakable crust so we decided to try to ski the Amora Vida first which was S/SE facing. This route is a steep, occasionally skied, very high quality line that can be skied from the summit of the South Teton. After I hurt my knee in 2016 I have been really into warming up my body, so I woke up around 1am to do 45 minutes of stretching with my host/mentor/ski partner Patrick and then eat breakfast, hydrate and head out the door. It was in the single digits at 2:30am at the trailhead but the rain crust combined with Patrick's invention of Skeats™ skin cleats made skinning up and out of the inversion layer and into the warmth of the high peaks fast and easy. We skinned up into Garnet canyon and took the South fork to the col between the South and the Middle Teton. From there we booted the NW couloir and we were on the summit in just about 5 hrs summit of the South and contemplated out descent. The recent storm had come with a lot of rime ice so we were a little worried about skiing conditions in the couloir. The snow was generally stable, but a fall in the over 50 degree couloir could be deadly*, so if conditions were not in, neither were we. The last half of 2014 was difficult for me personally. As many of you already know, I lost my dear friend Milly in October. She was more than a great dog. Her spirit was the better part of myself and my youth. We were wound together. I am still slowly coping with her departure and my own vanishing youth. Additionally, on Christmas Eve 2014, my Nonni died. She lived a full 97 years. Having survived WWII in Italy, she sought to raise her family alone. She was a woman of strong will. She was certain of her faith, and lived her life according to her beliefs, brooking no exceptions, for herself or her family. With her husband absent, she managed to bring 6 children to NY in 1960. She was the foundation of our family in this country. Nearly every Friday, and on all holidays, we young cousins gathered at her house in Astoria. The warmth, and noise, and chaos of that tiny house provided a haven; something solid, in an uncertain childhood. When we were at Nonni's house we knew who we were. Christmas Eve was her day. It was the most important holiday in our family. Her advanced age not withstanding, losing her on Christmas Eve was very difficult for all of us, and it was devastating for me. I was the eldest male grandchild, and as such, my Nonni took a special interest in me. Throughout my childhood and especially during my time in the Army, I knew her strength was with me. This winter, I spent much time in active meditation in the mountains. Many days I climbed alone, listening for the Ravens, the Earth form of the spirits of recently departed loved ones. On beautiful calm days, and on ugly wind whipped weather days, with friends or alone; the mountains listened to the Ravens and kept me safe. The day before I was set to drive back to NY; the day before I was set to leave the spirit world, I couldn't sleep. A storm had just cleared, and the previously veiled mountain peaks, shone sharp as the moon rose through the windless night. I left my cabin alone at about 11 PM and almost in a dream state I began to ski through the forest on approach to the Grand Teton. The light of the moon slowly began to wash away the stars as I climbed above 9000 ft, and into the soft snow dropped by the earlier storm. I had been climbing for hours and did not see the headlamp of another soul. I continued to dream-walk, and in this dream, everything seemed perfect. A night like this is one in a thousand during the winter in the mountains. All was perfectly still...no sound; no movement save the stars and the geologically slow crawl of the mountains themselves...and of course my own body passing through the timelessness. The sun rose as I climbed above the Tepee Glacier at about 12,000ft. I could see far below into the valley, but still no other climbers. I had climbed this route two years before, but in a group, and on belay. At that time I had slipped in a deadly spot on the ice waterfall further up and caught the rope of a climber anchored above me. Today, I felt the blessing of the mountain and continued on alone, still listening for the Ravens, who until now remained silent and out of sight. I strapped on my crampons and readied my ice-axes as I climbed the thin strip of snow between the cliffs on the way to the summit face. The conditions felt great and I resolved to continue until they might deteriorate. I sunk my ice axes deep into the ice on the falls and carefully climbed through the crux without slipping...which is why I am here to write! As I climbed up out of the cliffs and onto the summit face I heard my first Raven, and I felt deeply relieved. I breathed a bit easier even as I climbed close to the 14,000 ft summit. The winds were still calm...perfectly calm, as I have never before seen on a summit in winter. I had carried some of Milly's ashes, expecting to scatter them into the wind. But, miraculously (and I think I do mean to use this word in the Biblical sense, my lack of faith in any one particular religion not withstanding) I was able to set a pile of the ashes right on the summit marker! By way of prayer, I shouted my Nonni's name, Milly's name, and the name of a friend of mine who died in the mountains with me a few years ago. And then I readied myself for the descent. I skied in perfect powder off the summit! Such a feeling of pleasure I am unable to relate in words. (This is a picture from another peak, Mt. Moran, that I skied with a friend earlier in the season....so perhaps you can see what I mean.) I negotiated my way down through the cliffs, sometimes rappelling with the 100 ft rope I carried. And then I skied safely to the valley floor as late afternoon sun warmed the low elevation snow. The next morning another storm blew in, with 40 mph winds on the peaks. Milly now flies free over thousand of miles, even into the stratosphere. She is part of what we all are, what we all will be, and what we have always been. Mother Earth and I shared this brief and special instant in time. With my Nonni's strength, my friend's protection, and Milly's loyal love, I became a brush in Mother Earth's hand, and together we painted a portrait. And if it lasted for a thousand years or a few seconds, to the mountains and to the universe it was just the same. Our entire lives are like tracks in the snow. We strive, hopefully in concert with the Earth, and it is important to do so (I feel this way, although all logic and senses tell me that all we do is meaningless), but the grand sum of all our life's pursuit lacks any significance. What then is the purpose? Perhaps it is simply to strive, and once in a rare while, to be granted the gift of a perfect moment in which understanding, and knowing, and being are all the same.